In Chinese, the sea cucumber is called "Hai Sen" or "sea ginseng" is a "yang" or "heaty" food, reputed to be a general tonic and aphrodisiac. Rich in iron and contains minerals like calcium, magnesium and zinc, the sea cucumber has been known to help ease arthritis pain and relief joints discomfort. Sea Cucumbers are often sold in dried hard form and after removing the skin, you have to reconstitute it in water which is drained daily for 4 days, occasionally wash it under running water, boil it with slices or ginger or pineapple skin in between to remove the “fishy” odor, so that it expands to several times its original size and becomes soft again. Drain and keep in the refrigerator until ready to use. 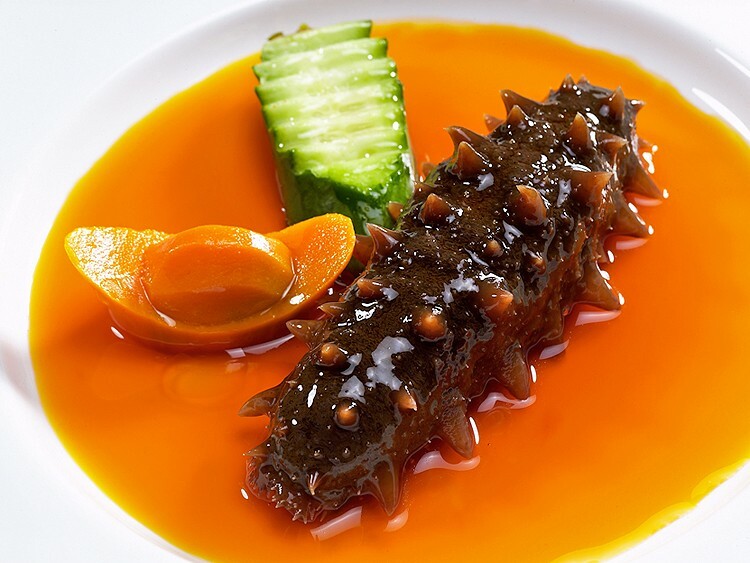 The best kind of fresh sea cucumber is black in color, with a smooth surface and fine gloss.